The dining / living room has a kitchenette with fridge, freezer, oven, toaster, pots, crockery and everything necessary for cleaning. In the living / dining room you will find a comfortable bed area bordered by a sliding curtain for easy privacy with a sofa bed with adequate seating for a family, buffet, table with four chairs. From the living / dining room you can access the adjoining bathroom with shower. Upstairs, reached by a wooden staircase, you will find a comfortable double bedroom with corner desk, closet / wardrobe, attached bathroom. The room opens onto a large terrace where you can enjoy a wide view of the countryside and surrounding hills. The house is surrounded by a 'large outdoor area and has convenient parking. The courtyard leads to the land of neighbors, so you must ensure that children do not disturb the neighborhood and do not incur risks due to lack of supervision. This is a perfect place for a relaxing stay! The peace and tranquility of the place is an inspiration and ideal for visiting the town of Fasano and also many nearby cities. International airports are just 40 minutes by car and are supplied for car rental agencies. Excursions include a main railway line, from the nearby station, connecting the major cities of the coast. Public transport in the area is limited and therefore it is recommended to obtain a car to explore the area and make sure you get the most from your Puglia. This will allow you not only to visit the local towns with ease, but also to make day trips to nearby areas. You can visit Bari and its coastal towns, Andria, Trani, Gravina, Matera with its stones (place of the movie The Passion of Mel Gibson) the Ionian coast, all the Salento with its picturesque villages and beaches, along with many cities medieval fortified. The Roman sites of Egnatia and Metaponto, the rock churches, the canyons and many other attractions of Puglia. The national parks of Gargano and the Murgia, marine reserves and Tremiti Islands Guaceto Tower and numerous protected areas, vast and varied natural landscapes now fully protected. - Putignano: from the agricultural center numerous caves, owes its fame to the carnival, an event of great attraction for the beautiful floats during carnival. What to see nearby: Trulli, a world heritage site, Alberobello grouped or distributed in the countryside of the Itria Valley. The historic farms, the underground mills. Ravines, hollows and sinkholes, run through the surface of an area strongly characterized by karst with its rich natural habitats and the many caves, underground rock villages and churches, places of great beauty. Nearby, at the abbey of San Lorenzo, a chance to visit the museum of olive oil. A wide choice among the many different beaches between Savelletri and Torre Canne, on the shores of the Adriatic, between the beautiful sea cliffs and wild beaches or between well equipped beach establishments. For children large amusement parks Fasanolandia - Safari Park and Waterpark Egnatia. Both bathrooms are equipped with sanitary accessories and recently renovated. The owners are available for information, suggestions, itineraries, tips. As responsible owners, ask that children are supervised at all times. We enjoyed staying at Le Fogge this autumn. It was clean, tidy, nicely equipped and centrally located among interesting towns. We were made very welcome by the owners. It was spacious enough for two people although there was no comfortable seating for the evening and the lighting was too dim for reading. The kitchen was well equipped and shower rooms were nicely appointed. The bed was comfortable with good quality bedding, although a couple of extra pillows would have been welcome. We would recommend this little apartment as a base to tour central Puglia. Ada and Martino are perfect and generous hosts. They live next door yet are discrete but available if any problem or question should arise. We were also the grateful recipient of some of Ada's amazing baking when she kindly brought round some pizza and a delicious chocolate cheesecake for us. The property has certainly been given the designer 'makeover' as you will see from the photographs so has lots of ornaments and quaint touches to give a very impressive appearance although because of this the practicality of living in the house as a holiday home and some of the available surfaces was occasionally compromised. There is a discrepancy with the facilities quoted on the HomeAway English version of the website however. There is no washing machine but there is a launderette in nearby Fasano if you need. The sofa bed is more accurately just a bed. So it actually means there isn't really somewhere to sit comfortably (i.e. a settee) in the living area only the kitchen chairs. Outside the patio was well shaded - very necessary as the temperatures were consistently in the low/mid thirties during our late July stay - and had good furniture for eating outdoors (the table was actually replaced by a new larger one while we were there) together with sun loungers plus a hammock. There is a sun terrace on the first floor just outside the bedroom which we found perfect for the first coffee of the day and again at night with a glass of wine to watch the sun set over the hills in the distance. The area has lots to see and the nearest coastal village of Savelletri is a beautiful setting for a great array of restaurants clustered round a quaint harbour- much like a Cornish fishing port only warmer! By contrast we found the other coastal town of Monopoli a disappointment: Fairly ugly and modern with not much of a beach to speak of. The 'trulli' village of Alberobello is a must and the many tourist souvenir shops have been well integrated into the setting so visually it remains pretty much unspoilt. Lecce is also worth the longer trip to see a good example of a typical old and well preserved Italian town. Our hosts were lovely welcoming people and the cake was to die for. Beach, supermarket, restaurants all close by. ( it was great to have use of beach umbrella ). It was very hot during our stay so we spent lots of time swimming so didn't get to visit all the places of interest on our list. We would love to return sometime in the future in early summer or autumn. 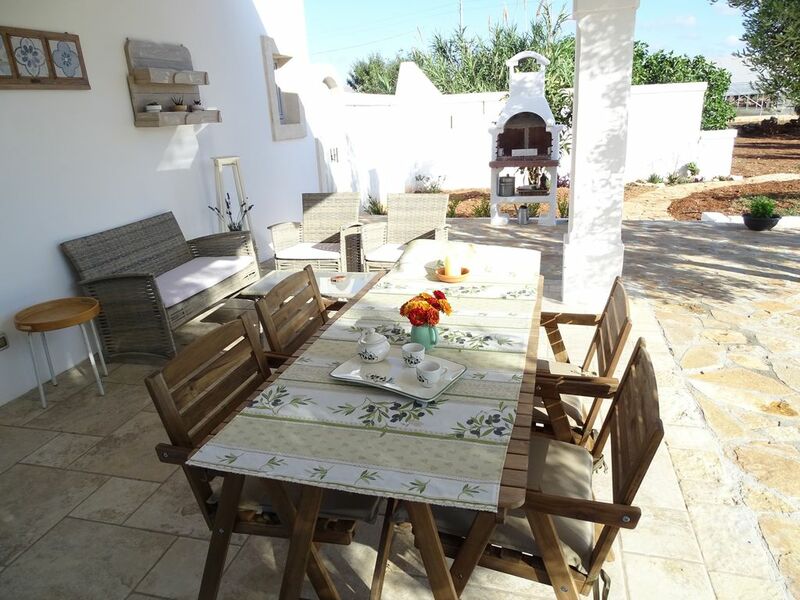 We have just come back home from this lovely house in Fasano, and we would love to go straight back! It was a very nice house with two really good patios to chill on. The house is in the country but minutes from Fasano and close to many places you will choose to see in the area. It is about 10 minutes from the beach too. We found it very peaceful and the owners Martino and Ada were there but very discreet. If we needed anything they were there to help. Ada brought us cakes which was a nice touch. There is no washing machine but otherwise the house is very well equipped. We found the bed comfortable and the two bathrooms were lovely. It has a bbq outside which we used, but there are many restaurants very close to the house. There is lots of choice. Supermarket is very close, only a few minutes away. The house was very nicely decorated and the hosts were lovely people. There was no problem in conversing with them. We would love to go back. A very nice property to rent. Really enjoyed the stay. Wat een hartelijke ontvangst in dit mooie huisje! Je ziet dat de eigenaresse oog heeft voor detail, de ruimtes zijn met veel smaak aangekleed. Wij vonden de 2 terrassen erg fijn. Beneden kun je lekker zitten of luieren in de hangmat en boven kun je heerlijk genieten op het grote dakterras. Fasano zelf lijkt op het eerste oog niet bijzonder, maar heeft een verrassend historisch gedeelte. Eigenaren geven goed advies over adresjes waar je lekker kunt eten. Wij voelden ons erg welkom! Très belle maison, très propre, très bien équpée dotée d'une terrasse très agréable. Merci ! Dès notre arrivée dans la maison, nous avons été charmés par l'accueil d'Ada et Martino, la décoration, l'agencement et les équipements présents dans la maison. Très propre, la maison nous a permis de nous sentir très rapidement chez nous (et en vacances !) dès le démarrage de notre séjour de 3 semaines. Les deux salles de bains sont un réel plus et la climatisation (présente au rez de chaussé ainsi qu' au premier étage) rend le séjour bien plus respirable, notamment la nuit. Cette dernière préserve aussi des rares bruits de fond environnants et de ces chers moustiques qui n'attendent pas d'être invités pour venir vous rendre visitie. Ada et Martino sont des hôtes discrets, très accueillants et disponibles. Ils nous ont offerts un excellent gâteau à la ricotta ainsi qu'un tiramisu : simplement délicieux ! Nous avons aussi apprécié la présence de poubelles de tri, la propreté extérieure ainsi que la terrasse sur laquelle nous avons pu passer d'excellents moments. Une maison à recommander pour un couple avec 1 enfant (ou sans). Des souvenirs plein la tête et une pointe de nostalgie à la vue des photos de notre maison des vacances. Merci encore Ada et Martino. This country house is located in the immediate outskirts of the city of Fasano, in a landscape surrounded by olive trees and fruit trees, in a quiet and relaxing. Nearby is a large hypermarket, swimming pool, gym, spa, shops for shopping, bars, cinemas. It's a great place for a family vacation to enjoy the pleasures that Puglia has to offer, both in pristine landscapes in the scenarios, both in folklore and in good food. The house is set in its own garden with a large backyard. E 'consists of a living room with a buffet, a table with four chairs, a comfortable sofa / bed for one or two people, a kitchenette, a bathroom. Upstairs, connected by a wooden staircase, a master bedroom with private bath. A veranda with table and chairs on the ground floor in addition to a large terrace with panoramic countryside and olive groves on the top floor. Beaches, golf courses, Safari Park and other attractions are within a short drive.